This is really helpful as I’m building a house right now and wiring throughout. Can I hook up my Apple TV to the receiver and just control everything through that? How many hdmi ports does a standard reciever have nowadays? If you’re going to have wired speakers throughout your house, you can totally have them all terminate at a single receiver (so long as the receiver is equipped for the number of rooms/speakers you plan to use). And you can simply plug a single Apple TV into an HDMI port on the receiver and be able to control the audio throughout your house from your phone/ipad/computer/etc. Even the more reasonably priced receivers today have at least 4 HDMI ports (i wouldn’t consider one with less). BUT If you’re building a house and have a little wiggle room in your budget, I would seriously consider using one or two Sonos amps to control all the music through your house. It takes out the middleman — no need for an Apple TV or a receiver. A single Sonos amp can do the job of both. Just a thought. I have a set of wired JBL speakers outside, in the livingroom and master bathroom. All for same song listening. How many speaker sets can one Connect Amps drive? Your comment makes it seem like multiple but I’ve read it’s a 1:1 ratio. 1 connect amp : set of speakers. Thanks for any feedback. Sorry for the delayed response! Hope it’s not too late offer you some notes on my set-up. I actually have TWELVE speakers connected to the a single AMP. The house was prewired for sound throughout for a total of 12 speakers (6 pairs) indoors. The Sonos AMP plugs into a single speaker switcher, which then goes out to all the speakers. The official recommendation of Sonos — and probably any professional speaker installers — is to use just one Amp per pair of stereo speakers. So I initially only did this set-up as a test case, to see if a) the sound would be strong enough in every room and b) the Amp wouldn’t overheat (which I suppose is theoretically a risk). 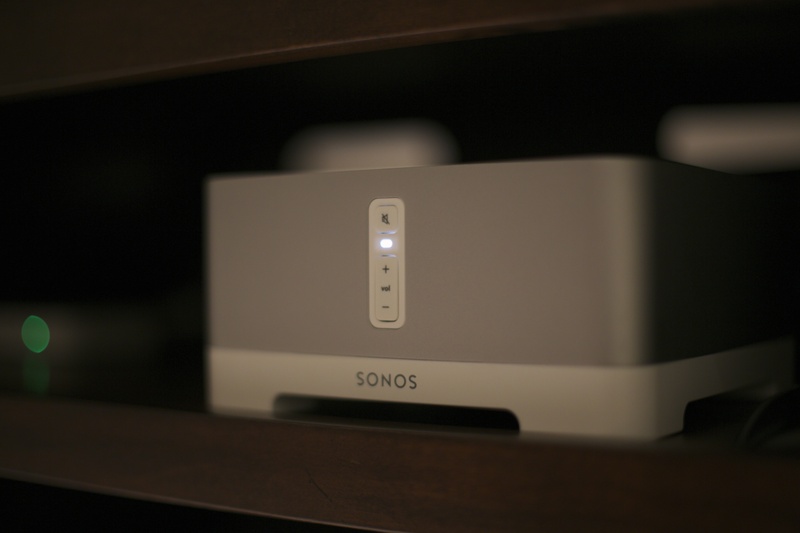 The ideal set-up, of course, is to use as many Sonos Amps as you can afford, since that gives the most customizable set-up, not to mention uses all the fancy networking features that comes built into every Sonos device. I’m basically just using my Sonos Amp to pipe Pandora through my home, with the ability to turn it on and off from my phone. That’s very convenient, but it only touches the surface of what the Sonos system is capable of with multiple Amps/devices. Also: I don’t play loud music. At no point have I the volume turned all the way up on the Amp going to all the speakers… Part of me avoids doing that out-of-caution. But, realistically, it’s also something I’ve never had to do. At half-volume, the Amp is more than enough to supply background music throughout multiple rooms. This is all my experience, though. Individual results may vary. If you are going to experiment with multiple speaker sets hooked up to the same Amp, I’d definitely do so within the warranty/return period of the Amp. Eric, your explanation is really clear and crisp, especially for someone new to this dialogue. i was wondering if you’d have any advice on my home audio set-up. I have AppleTV running on the TV and have decided to de-scope this from the set-up. I have 10 in-ceiling speakers (5 pairs) that have been sitting there unused for months. They are all the same Pyle PDIC 60T speakers (8ohm, 70v). Four sets of speakers are in the LR (2), DR (1), Kitchen (1), and another set upstairs. Just curious if i could use the SONOS connect amp with a speaker selector (the SSVC-6, for example) to run all 5 sets of speakers. The SONOS Connect Amp isn’t cheap, and I’m wondering if I could do this for now, and then later add the appropriate number of units. The speakers are for distributed sound mostly during entertaining, so I’m not worried about separate sources. There are also 12 speakers to connect later, so I have to think about scalability down the line as well.